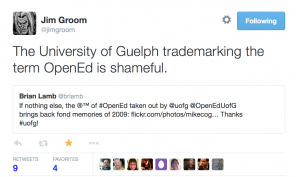 Like many other people, I had an emotional response to the news that a community-oriented open education conference (one in its twelfth year of existence) was being targeted by a trademark claim by the University of Guelph. Clint Lalonde provides a detailed account. But before I articulate my feelings, I have to acknowledge there is much I do not understand about this whole affair. So for now, I will address my questions to the University of Guelph as an open query. I hope this will find its way to someone who can and will address them. 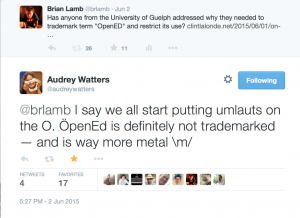 Why did the University of Guelph feel it needed trademark protection in this instance? How did you become aware of this perceived “infringement” of this trademark? 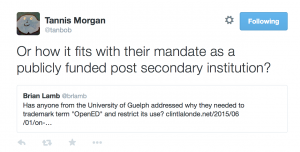 Can you explain how the Open Education Conference, and BCcampus’s use of the term “OpenEd” does harm to the University of Guelph? Did you know that BCcampus co-organized this conference in Vancouver in 2009, and again in 2012, well before you initated your trademark claim? I was also a co-organizer of these conferences when I was at UBC. The whole organization played a role, the work that Scott Leslie of BCcampus did was indispensable. Looking at the University of Guelph’s Open Learning and Educational Support website, I could find no mention of open educational resources, open textbooks, open pedagogies, open source, open access, open licensing, etc… So perhaps you were unaware of the existence of an “open education” community, one that frequently uses “open ed” as an abbreviation, or for functions such as URLs, or as a Twitter hashtag. 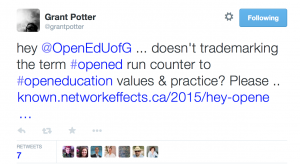 Were you indeed unaware that “open ed” was a thing? If so, when did you become aware of it? I am presuming you know about the “open ed” community now. It is a growing international movement, dedicated (among other things) to removing the legal barriers to sharing knowledge. Can you understand why the open ed community finds this trademark to be highly ironic in a clueless sort of way, or even hostile and offensive? Does this give you pause? Do you feel the legal fees associated with securing and enforcing this trademark are a judicious use of increasingly scarce funds by a public post-secondary institution? 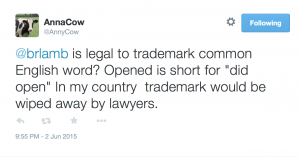 In your trademark application, you do not merely seek to trademark a logo or design (as is common), but the word “OpenED“. Yet you apply your trademark to the differently capitalized “OpenEd“. (Indeed, that seems to be your preferred capitalization in practice.) Do you claim dominion over all capitalization possibilities? Or spacing, ie “open ed”? Do you now own the past tense of the word “open” as well, ie “opened”? A number of us have been asking some of these questions on Twitter for quite some time. I first Tweeted about it when I learned of the application last year. The Twitter account associated with “OpenEd – U of Guelph” has been responding to other Tweets, but so far been ignoring these queries. I hope we will learn more about the intentions associated with this action, if only so we may fairly assess what’s going on. “It has come to my attention that the University of Guelph, my alumni, has trademarked “opened” and is threatening others who use it with legal repercussions. 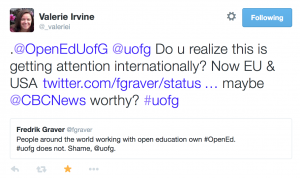 OpenEd is an commonly used abbreviation for open education everywhere around the world and is even more frequently used in association with the more recent phenomenon of Open Educational Resources, That UofG would stake claim to that phrase and then threaten others who use it is offensive and ridiculous. This kind of legal action and enclosure is common in the US but to see it here in Canada and from my own alumnus makes me ashamed of UofG. It is completely in opposition to anything even remotely related to “openness”. Did not receive a reply of any kind. Hi Paul, I imagine you and Clint had many conversations about what to do and I also believe your email did have a positive effect. . . the thoughts you shared circulating within the many conversations they likely had at the University too. The offer that was made could be seen as a positive outcome – just recalling that “a permission contract ( $500), [UoG] would allow [BCcampus] to use the term in perpetuity to describe any open education activities in BC that we were associated with.” Am looking forward to see the Design ideas that will come out of new iterations of open education.